You are here: Home / News / The Green Link meets with the University of Extremadura and the Global Nature Foundation. On Thursday March 23rd, the Volterra team met with Gerardo Moreno of the University of Extremadura and Laura García of the Fundación Global Nature. Laura and Gerardo have worked together for several years on one of the foundation´s property, called ‘El Baldío’, located in Talaván (Caceres, western Spain). 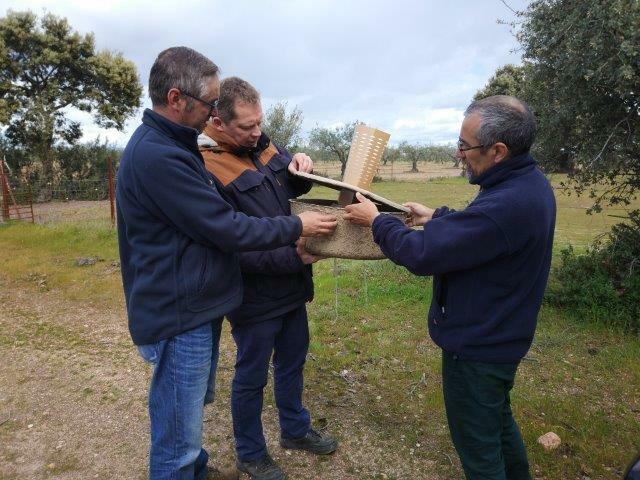 The team visited the property together Gerardo and Laura, who they gave explanations on how a proper management of the soil with biodiverse seed mixes and rotational grazing planning can improve the biomass production and the activity of the soil. The Volterra team introduced the people of UEx and the foundation to our project Life project ‘The Green Link’. All agreed that the Cocoon could be an interesting solution for reforestation of the most difficult parts of the terrain, where water for initial irrigation is lacking.